EDEN PRAIRIE, Minn. — Case Keenum took the shotgun snap for Minnesota on the third play of the game and dropped back in a clean pocket, with no pressure from Tampa Bay in sight. After Adam Thielen used a double move to gain a step on Buccaneers cornerback Vernon Hargreaves III, Keenum let the ball fly up the left seam. Hargreaves tried to thwart the play by pulling back Thielen’s right arm, but Keenum’s throw was in the perfect spot. Thielen tracked the ball over his shoulder and hauled it in with his opposite arm for a 45-yard gain. The Vikings scored on Dalvin Cook’s first career touchdown run four plays later and cruised to a 34-17 victory on Sunday. Lately it’s been the other way around in Minnesota. The defense in four seasons under coach Mike Zimmer has been the unquestioned strength of the team, but in two decisive wins at home this season the offense was the unit that stole the show. The Vikings finished last in the NFL in rushing last season, making Sam Bradford’s job more difficult without a way to lure more defenders closer to the line and thus open throwing lanes down the field. He set the all-time record for completion percentage, but his accuracy was aided by being forced to settle for shorter, safer throws. Thielen, Rudolph and Stefon Diggs proved to be capable route-runners and pass-catchers when Bradford had time to find them, but more often than not he was under pressure behind a patched-together, leaky offensive line. First, the Vikings needed to fix that front five, and with a new starter in each spot the revamped group has so far worked well. Pittsburgh put plenty of pressure on Keenum in the loss on Sept. 17, after Bradford was ruled out with an ailing left knee, but the Steelers employ an aggressive scheme that can be hard to diagnose. Behind play calling by offensive coordinator Pat Shurmur that was tailor-made for the more-mobile Keenum against the Buccaneers, when Bradford was ruled out two days before kickoff, the Vikings were rolling from the start. Thielen (299 yards) and Diggs (293 yards) are second and third in the league in receiving, respectively, behind Pittsburgh star Antonio Brown. The Vikings are third in the NFL in passing yards, behind New England and Green Bay and ahead of New Orleans. That’s exclusive company with Tom Brady’s Patriots, Aaron Rodgers’ Packers and Drew Brees’ Saints. 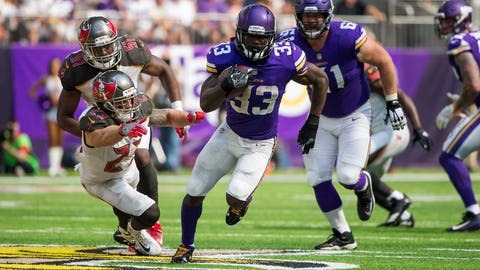 Cook has 288 yards rushing, the most in Vikings history in a rookie’s first three games. That’s also good for second in the NFL behind Kansas City rookie Kareem Hunt. Cook also had 72 yards receiving against the Buccaneers. His all-around ability, from accelerating through a hole to bouncing off tacklers for extra yards to picking up a blitz to catching the ball out of the backfield, has transformed this offense.